Just in time for summer: Sand In My Shoes! Liner notes for Sand In My Shoes. Summer is already upon us down here on the coast. I hope everyone out there has a good one. Enjoy the music! 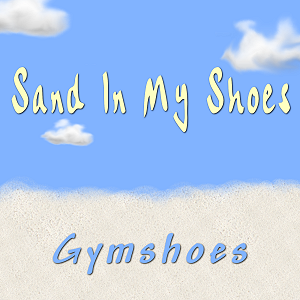 Posted in Gymshoes, Music | Tagged music, summer | Comments Off on Just in time for summer: Sand In My Shoes! Got an e-mail from a friend yesterday—all three Gymshoes albums are available from iTunes now! I’m in the process of getting my albums into online stores and they’re springing up sporadically like wildflowers all over the place, but should be in all stores by the end of March, first week in April at the latest. These three albums— Lost In The Mix, Halloween Soundscape, and 3 EPs—will be available from: iTunes US, Canada, UK, EU, Australia, New Zealand, and Japan; Amazon mp3, Napster, and Rhapsody (which includes iLike). Here’s what you can find where, right now: iTunes has Lost In The Mix, Halloween Soundscape, and the new album 3 EPs, which is a compilation of 3 early EPs. Napster also has all three albums. Amazon mp3 has 3 EPs and Halloween Soundscape. Rhapsody just has Halloween Soundscape so far. I suppose I should’ve made a fuss about the new release, 3 EPs, but it’s a compilation of previous releases, so a bunch of ballyhoo about it seems silly. Not that it isn’t good music. It is. 🙂 So there. Maybe I’ll holler about it later. At present the EP, A Tropical Depression, is still available through BlastMyMusic, with all profits going to the American Red Cross. After some reflection I’ve decided to move “A Piece Of Fiji”, which was a bonus track on A Tropical Depression, to the ongoing Sand In My Shoes project. It never really fit thematically with the other album, but does fit into the newer project. 😀 I’ve shifted the listing on the download page and made changes to the liner notes for ATD. Hi, everyone! First I must make abject apologies for being so slow to release new music. I’ve been having adventures with computers lately which has slowed me down. Escape To The Funhouse: This is on-going project. The first track for this was finished earlier this year, but has not been released. I’m holding it back as new track for one of the download sites. However, the second track—which is the title track—is now finished and available for download today! “Escape To The Funhouse” is a fun, energetic bit of electronica. As promised, I’m now also releasing the mp3 for “Flutterbye Butterfly” which which was done for a video earlier this year. It’s the first track of a project I’m calling Sand In My Shoes. I haven’t yet written liner notes for these two projects; I’ll drop a note in the blog when liner notes are available. Streaming Audio: If you haven’t been to the Gymshoes site in a while, one of the new things you’ll notice that I now have streaming audio in the sidebar and elsewhere. Culture Foam: Gymshoes music has been chosen for the intro and bumpers of Culture Foam, a new podcast being done by writer and filmmaker Sandy Clark of American Scary fame. Culture Foam is an interview show looking at geeky topics from science to games. Creator Sandy Clark will be doing Culture Foam as a side project while he writes and looks for a new documentary subject. He says, “It is a great excuse to recycle my source material as a journalist and an opportunity to interview folks I have no business talking to.” It’s a catch all project for Sandy, letting him recycle interviews, his journalistic source material. One topic explored in an upcoming podcast will be the Drake Equation. Often presented as the best educated guess at the number of intelligent species in the universe, according to Sandy, it also makes a brilliant survey of the sciences. Sandy says he really wanted to use “Zen Garden Groove” with the Drake Revisited project, but decided to fold “B3 Boogie” into the larger Culture Foam project instead. “‘Zen Garden Groove’ had a fun, cosmic and thoughtful edge that sounded great as an opener for a discussion of science’s big questions and alien life,” Clark says. “When I opened the topic list up to geekier things, I went back to the Gymshoes catalog for something more openly playful. ‘B3 Boogie’ was it.” At present there’s a test podcast up featuring “B3Boogie” as the intro and a nostalgic chat about gaming with an old friend of his, but the real podcast should be up and running soon—and weekly!. No more Sneakers: I must admit that the whole “newletter subscribers hear it first” thing has pretty much fallen by the wayside. The way it was supposed to work is that the dedicated fans download a pre-release copy of the music, tell all your friends about it, then when the music is officially released shortly thereafter, the buzz generated results in more downloads, comments on the blog etc. What actually has been happening is that when I give out a pre-release URL to download the music, subscribers and all their friends download the music, then when the music is officially released there’s no increased activity on the website—and no comments on the music, ’cause everyone and their dog had already downloaded it….and moved on. Instead of generating interest in the release, “sneakers” has acted as a total buzzkill. Which is why I’ve been moving away from it—and am now officially dropping the practice of pre-release downloads entirely. Rock and Roll: Finally, some friends of mine in the bandPoets and Pornstars are touring right now. If they come to your town, don’t miss them! They have just released a single from their upcoming album. The single, “Rock and Roll” can be downloaded from all the usual sites. You can get more info on the tour and music from my fan blog:Reckless, Pretty & Wild. If you love rock and roll, please support this band by downloading their single, “Rock and Roll”. Thanks!